The yen and Swissy may come from opposite sides of the world, but they have been treated the same this year. Both of them were considered “safe” and were bought up during times of risk aversion. I know that in terms of relative economic strength and fiscal soundness, they aren’t the shining examples of a traditional “safe haven,” but there is no doubt in my mind that both currencies gave traders a sense of security. The Swissy was bought up because it was a good alternative to the euro, while the yen rallied due to the unwinding of carry trades. Unfortunately, the rising value of the Swiss franc and the Japanese yen posed a serious problem to their respective economies. Since Switzerland and Japan’s economy are both heavily export-dependent, a strengthening domestic currency could dampen demand for their goods and services. In response to this, both the Swiss and the Japanese governments, with the help of their corresponding central banks, tried their best to keep their exchange rates down. This was the major theme that drove both currencies’ price action. In the next two sections, I’ll do a quick but hopefully meaningful review of the major events that transpired for both the Japanese yen and the Swiss franc. In March 2011, Japan experienced a massive 8.9 earthquake and tsunami that shook its foundations. At first, people thought the yen would experience a huge beating similar to what happened to the Kiwi when the Churchill earthquake hit. But instead, traders actually bought the currency up on the news that the damage would lead to a repatriation (or the process of returning something – in this case, the Japanese yen – back to its place of origin) of funds overseas. BOJ Governor Maasaki Shirakawa also created a 12 trillion JPY aid package to help Japan. 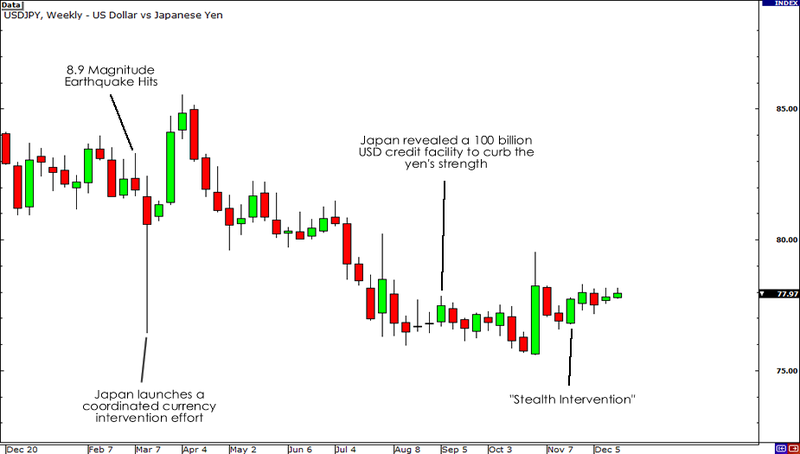 Japan had intervened many times in the market but once the smoke cleared, the yen once again rallied. So on March 18, 2011, Japan did something different. In response to the appreciating yen, Japan, together with the other members of the Group of Seven (G-7), launched a coordinated currency intervention to stabilize the yen. The decision to take action was because the euro’s weakness increased inflationary pressures to undesirable levels. Within just two months after the coordinated intervention, the yen was back to its strongest level versus the dollar. To curb the strengthening yen, Japan tried to do something different. Instead of directly intervening, Japan provided a 100 billion USD credit facility for businesses to be used to purchase goods and services abroad. Japan hoped that the yen flowing out of Japan would put downward pressure on the currency. Since the massive one-time intervention bombs weren’t working, Japan tried a new tactic. The Ministry of Finance launched what the market called as “stealth intervention,” where the yen is sold in smaller but still significant volumes without telling the public. Japan had learned that selling the yen in massive one-time just doesn’t work, as the market becomes eager to buy it again soon after because they know that the next one won’t come for quite some time. 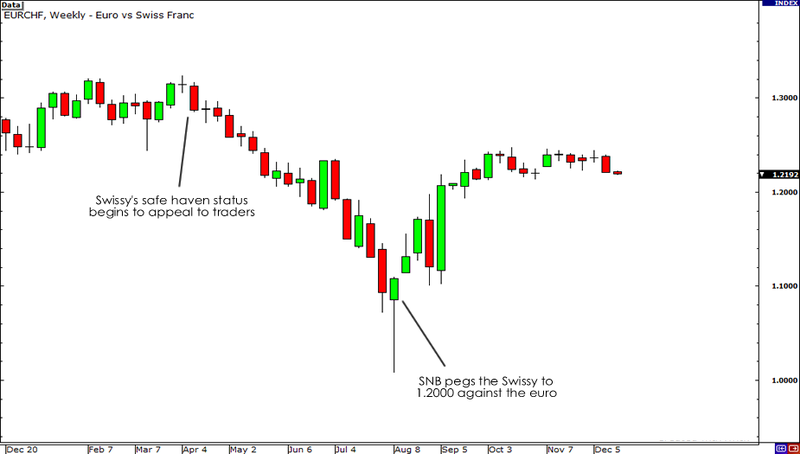 Early in the year, the Swiss franc was considered as one of the best currencies to buy in the forex market. More than the currency being considered as a “safe haven,” Switzerland’s economy was doing well and gold prices was also rising. One thing to note Switzerland is that about a fourth of its currency reserves are backed with gold, so whenever the price of gold rises, their currency, the Swiss franc, gains as well. From January to July, the Swiss franc rallied strongly across the board, most notably against the euro. The persistent rise of the Swiss franc was seen as a major threat to the country’s recovery by the Swiss National Bank (SNB). Towards the latter part of August, the SNB finally stepped in and announced that they have decided to peg the Swiss franc to 1.2000 euros. The central bank said that they were ready to put in an unlimited amount of money to make sure this happens. Since then, EUR/CHF has been trending higher. What can we expect from the Swissy and the yen? Perhaps the most important thing we can learn from the major themes that drove the Swissy and the yen is to always consider market sentiment, as well as intervention fears, when trading them. These currencies are watched heavily by their respective governments and central banks, so it is only prudent to put more weight into the words of their financial officials rather than economic data. For 2012, it looks like this currency intervention theme will remain as the Swissy continues to trade dangerously close to the 1.2000 level against the euro and the yen is still pretty strong versus the dollar at 78.00. If you’re looking to hold long positions over the long-term on these currencies, please be careful! Of course, I always welcome counter-arguments so feel free to share your thoughts below.